Back in 1990, I had my first trip to Singapore. I guess you can call it love at first step when I immediately fell truly madly in-love with this fellow ASEAN country near the equator. It could probably be because of its clean and green-friendly environment (no trash, no vendors! ), the honesty of the people (this was back in 1990s..have to update this info soon) and the food. It was the best 2 week vacation then as we went around the different tourist sites, shopped till we dropped (the exchange rate was still low back then), met up with old family friends and lastly tried out the different possible combinations among the following: roast chicken/duck/pork + rice/hofan/noodles. Every meal is truly exciting as we happily mixed and matched our meat with its perfect carbo pair. Since then, I knew that Singapore is the place I want to be in forever. It has been a while since I've been to Singapore. Times have changed and there were quite a number of new attractions available like the Esplanade, Ministry of Sound and the man-made beaches in Sentosa. Soon, I know I just have to go back and experience it myself. Here in Manila, I was lucky enough to discover a new restaurant that reminded me of my favorite country. Located at the Block 9 of Rockwell Center, Good Earth Roast may be more popular to the night crowd who'd hang out till the wee hours of the morning as they drink, party and eat. For a Manila yuppie like myself though, Good Earth Roast is a perfect lunch out destination. It's proximity to my office is just right, the parking a bit challenging but manageable and the food and service perfect. It does not require a perfect food IQ to order here. Simply match the four different meat dishes: asado pork, roast chicken, crispy pork and roast duck to the following-- plain rice, fried rice, hofan, mien (noodles), soup noodles or congee. It was fun mixing and matching the different combinations to see which pair's best. 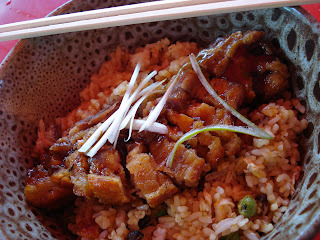 Alas, after four visits I found my favorite : crispy pork and fried rice. I like the fact that I do not have to constantly spit out chicken/duck bones and still keep my poise while eating neither do I have to struggle with the asado meat as I try my darnest to cut it using my teeth. Although a bit on the calorific side, the crispy pork is fragrant and tasty. As for the carbs, I find both hofan and mien a bit dry and cold on both visits, at some point it felt like I'm eating cardboard strips even if I tried to add more toyomansi. The plain rice is ok for those who'd like to have it simple while I, a certified fried rice fan, adores this option. Mixed with chinese sausage, onion leeks, garlic and peas, GER's fried rice is really yummy and perfectly matches the crispy pork. Good Earth Roast is my little Singapore here in Manila. If only they also have my favorite Bah Kut Teh then it would have been perfect lah. Good Earth Roast is located at the Block 9, Rockwell Center along Rizal Drive. It's Ministry of Sound (MOS). And you're always welcome to come back! I was in Singapore last year and I have to say that it was urban perfection. But I think it was the Manilenio in me that craved for chaos and disorder. But the food was grrreat!